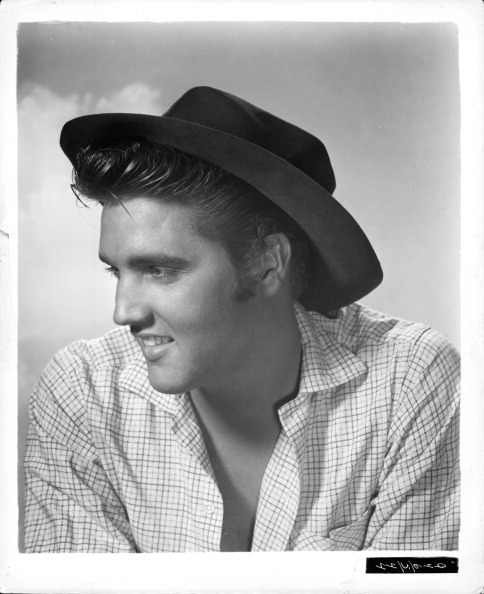 Being a legend like Elvis Presley, the looks, the hits and his image – it’s easy to overlook his movies. Elvis made thirty-one feature films and two documentaries. Elvis wanted to be a film actor as music as he wanted to be a performer. Elvis grew increasingly upset as the years rolled along and a endless cookie cutter mentality was created after the success of his biggest picture, “Blue Hawaii” in 1961. 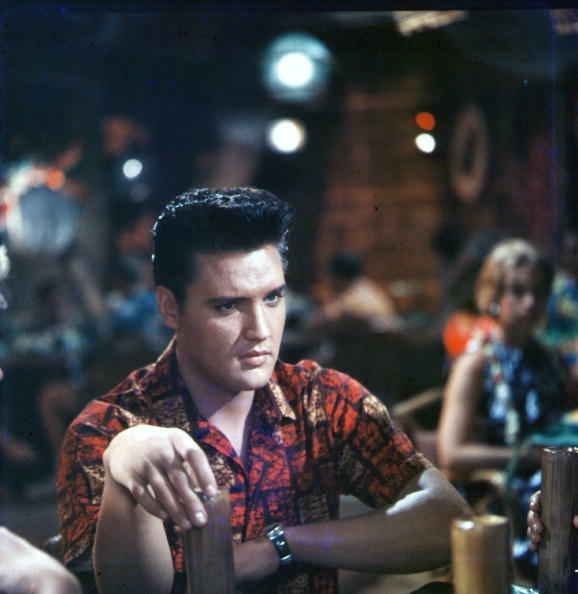 Elvis looking perplexed on the set of “Blue Hawaii”. Paramount Pictures’ legendary Hal Wallis and Elvis’ manager Colonel Tom Parker were behind these cookie cutters. One of the first films to try and duplicate the success was “Girls! Girls! Girls!” Elvis said to co-star Stella Stevens ” Why knock success?” In 1962, Elvis could say that, but he hoped for better projects. At the time, according to Stevens, Elvis seemed upset at her for the suggestion of doing stage plays and honing his acting chops. Actress Stella Stevens with Elvis in a promo pose in 1962. 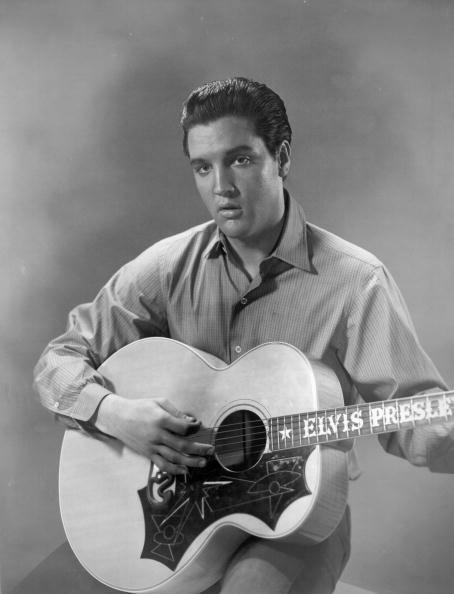 Let’s go back to 1956, the beginning of Elvis’ dream of being a good actor, he had said “I wouldn’t care for singing in the movies.” He took a acting test as well as another test filmed in color performing “Blue Suede Shoes” with a prop guitar – no strings. He passed the audition. Elvis was first offered a part in “The Rainmaker” with Burt Lancaster and Katharine Hepburn, but to the promising star’s dismay, Paramount loaned him out to 20th Century Fox to film “The Reno Brothers”. Elvis in a publicity pose for “Love Me Tender”. A Civil War tune called “Aura Lee” was transformed by songwriter Vera Matson wth original lyrics – it became the title song of the movie. Producers were so elated by the song that they renamed the movie “Love Me Tender” and added three more songs., “Let Me”, “We’re Gonna Move” and “Poor Boy”, complete with some gyrations on a couple of them. Yet, elvis pulled it off. The film co-starred Debra Paget, whom Elvis fell for. At the time, Paget was dating Howard Hughes. Cliff Gleaves witnessed Hughes following Elvis as he tried to win Debra’s heart, but her mother would have no part of it. In the end, Elvis gave up. They did appear on “The Milton Berle Show” together. The film actually starred Richard Egan and the supporting cast included Wiliiam Campbell and James Drury, who in a few years became TV’s “The Virginian”. Elvis gave a good acting job in “Love Me Tender”. Actually, if the three songs weren’t included, it may have been a different beginning for Elvis. Ray Manzarek, the founder of The Doors cited “Love Me Tender” as his favorite film and told me that it was also Jim Morrison’s favorite picture. Elvis performs “Mean Woman Blues” in “Loving You”, 1957. 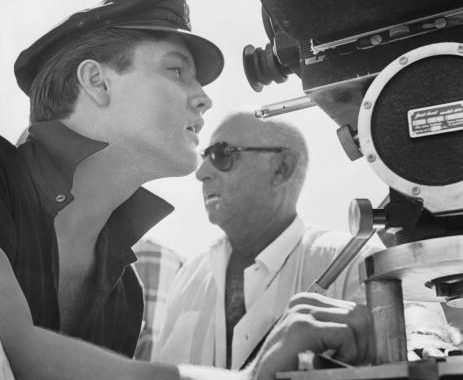 The second film was for Paramount, “Loving You” tailor made for Elvis by writer Hal Kanter. Kanter followed elvis around on tour and back to his home in Memphis to get a feel of Elvis’ life. This is a fun gem and a classic picture. A great supporting cast for Elvis here, Lizabeth Scott, Wendell Corey, James Gleason and the lovely Dolores Hart. Some good tunes and a hit album. The hit songs “Teddy Bear” and “Loving You” are featured as well as the unforgettable “Mean Woman Blues”. A lot of exuberance in this picture, even with the extras. 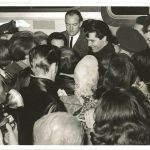 “Loving You” is a must for Elvis fans and those who have an interest in Elvis’ life, though fiction, it mirror some aspects of his life, such as his personality and good nature. 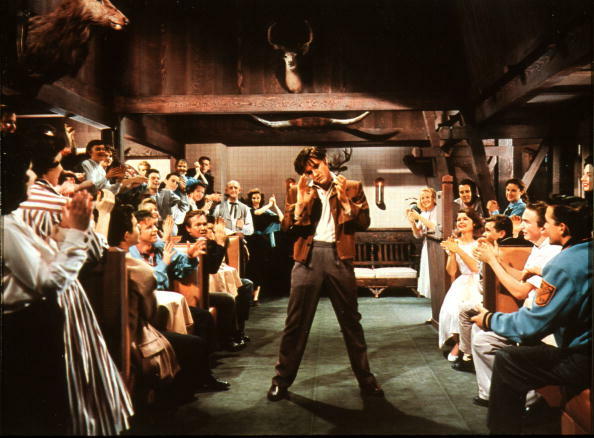 It also captures the rebel Elvis and features Elvis’ parents Vernon and Gladys Presley in the final song, they are in the audience cheering him on. Elvis with co-star Judy Tyler, who didn’t live long enough to see the picture released. The third picture is for Metro Goldwyn Mayer, the title was “Jailhouse Rock”. 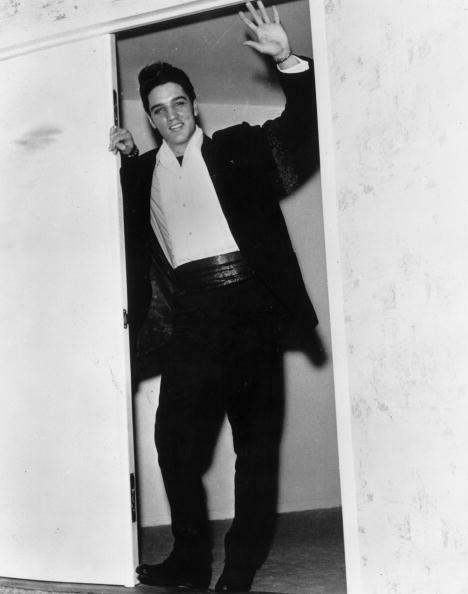 Elvis’ pal George Klein told me that it was really the big time at MGM, Elvis had Clark Gable’s dressing room. George spotted some Western stars there like Glenn Strange and Bob Steele, Elvis held up shooting for a bit so he could talk with them. The formula at this time seemed good, a handful of songs, instead of a dozen and a good story. Again, Elvis had a good supporting cast and classic songs, the title song and “Baby, I Don’t Care”. By the way, that’s Elvis doing the bass runs on that recording. 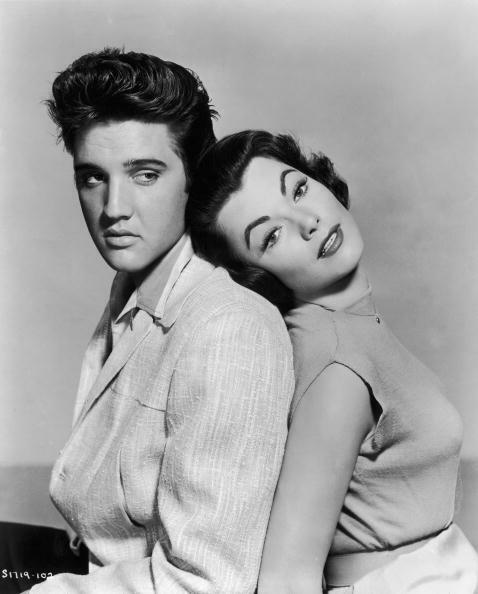 The beautiful song “Young and Beautiful” was sung to Elvis’ leading lady, Judy Tyler. Tragically, Jusy Tyler was killed on her honeymoon in a car crash. According to George Klein, Elvis came to his house and tolk Kelein’s mother that he had to talk with George. When he came to the door, Elvis was quiet. Klein asked what was wrong. Elvis said, G.K. , Let’s go for a ride. After a few moments, elvis said “Judy Tyler got killed on her honeymoon.” Elvis was very distraught, he liked Tyler very much, and then she was gone. They just drove around Memphis together so Elvis could wrape his head around the reality. 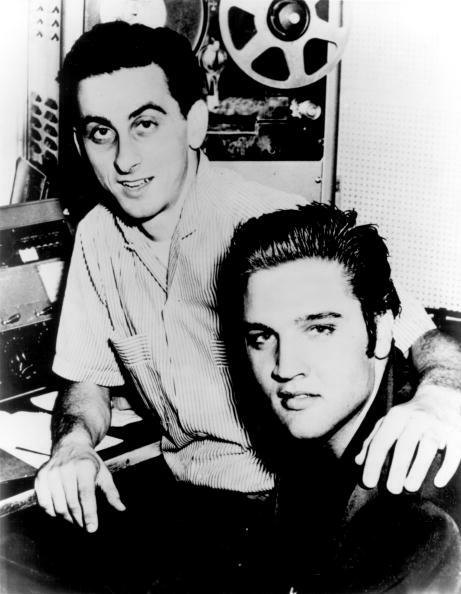 George Klein, a close friend to Elvis, pictured with him, in 1957. “Jailhouse Rock” is a true classic and is enshrined in the Library of Congress to be preserved as a significant element of our culturral history. It’s a must for any Elvis fan and film collector alike. Elvis does an impressive job. Alex Romero choreographed the dance number of the title song, after Elvis showed him his moves. Romero incorperated it and it was easy for Elvis. essentially, it is the very first music video – long before MTV. 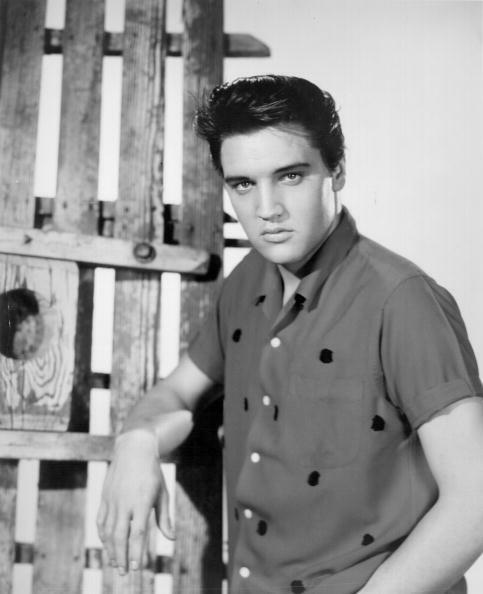 Elvis in a promo still for “King Creole” in 1958. Elvis was drafted to the U.S. Army and asked for a deferment for making his fourth movie, “King Creole”. The part was intended for James Dean, as a boxer. Of course, Dean was killed in a traffic accident in 1955. It was custom fit for Elvis as a singer in New Orleans. “King Creole” is the best of the Presley canon. Not only that, it was the only film that Elvis would really talk about, he was proud of the film, and justly so. 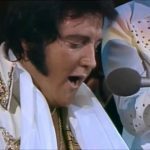 Without getting very much into the storyline, it is simply the film, if you would have any film to show Elvis’ acting ability and great musical performances, this movie gives it. Top actors and actresses compliment each other and, of course Elvis: Walter Matthau, Carolyn Jones, Dolores Hart (once again) Vic Morrow, Jan Shepard, Dean Jagger and Raymond Bailey (the future ‘Mr. Drysdale’ on “The Beverly Hillbillies”. Elvis in a publicity pose for RCA in 1961. No one but Elvis could have pulled off the future weak scripts and still come away a success. In the mid sixties, Elvis told his friend Larry Geller that he wanted to give it all up at one point, the movies and his career. Larry talked Elvis out of it. By this time he was deeper in his spiritual quest. something that Colonel Parker was threatened by, but that is another story in this series. 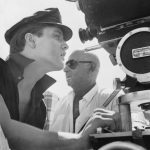 It’s reassessment time, a time to look back and see some hidden gems and learn some rarely known instances and facts concerning Elvis’ film career. 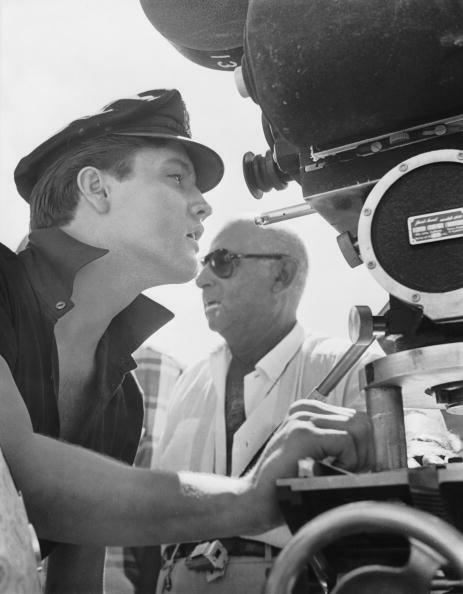 When many film stars were going on location in other parts of the world, Elvis kept working in Hollywood, and not only that, he kept many others working there at the same time. In Part Two, I will explore the early 60’s and Elvis finding his place in that new world. The quiet times and the times when Elvis knocked the door down yet again, to an unsuspecting public.